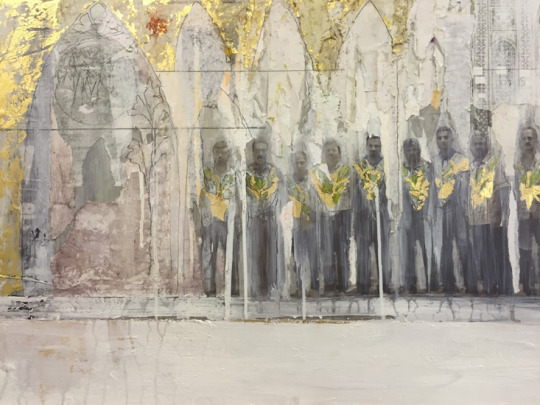 Private View at Fosse Gallery: Sunday 7th February 2016, 11am – 4pm. The Exhibition continues until Saturday 27th February 2016. We have certain expectations of art from war zones—that it should feature battlefields, be predominantly khaki-coloured and be painted by men. The art of Charlie Calder-Potts defies them all, despite drawing on her experience of being alongside the British Army in Helmand and Kabul in 2013. Unlike most war artists, Calder-Potts was not ‘parachuted in’ to alien territory. She has been travelling around the Middle East since her teenage years, immersing herself in the rich culture of a region now almost exclusively presented by the media as an ideological battleground between East and West—a perception her exhibition sets out to correct. She has developed a unique method of combining old and new in a single image. Using her own black and white photographs taken in Yazidi and Syrian refugee camps and in Erbil in Iraqi Kurdistan, she etches the photographic images onto sheets of metal—including recycled plates from scrapped ‘Warthog’ armoured vehicles brought back from Camp Bastion for her by the RAF—and begins to build the picture up in layers. 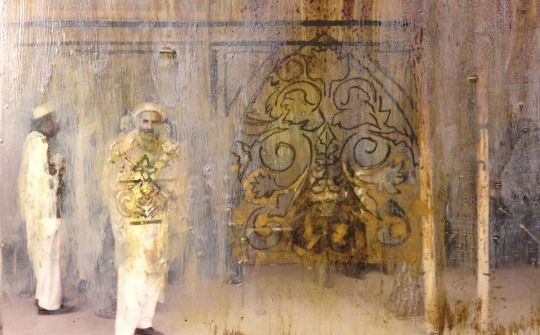 Oil paint, pastel, pencil, ink, crumpled tissue and beeswax are progressively applied to the printed surface in glowing veils of textured and patterned colour, studded with signs and symbols that set the human figures in context and turn the picture surface into “a palimpsest of past and present, East and West”. 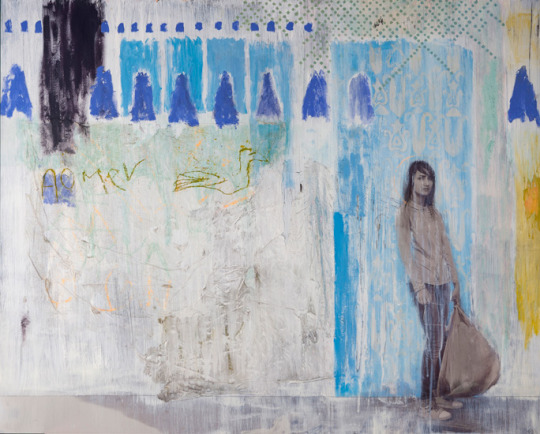 In I am still here, an Iraqi Kurdish girl in western dress carries a bin bag along a street in Sulaymaniyah beneath the inscription in the picture’s title, seen by the artist graffitied on a cell wall in the Sadaam-era prison in the city centre. There’s no religious or moral message to Book of Kings; if these poetic paintings teach us anything, it’s the lessons of history. “But all the world is like a tale one hears; men’s evil and their glory disappears,” reads a manuscript quote from The Shahnameh under one image of a mosque in Iraq. Calder-Potts chose the exhibition title because “kings rise and fall and make the same mistakes their predecessors did”. By peeling back the layers of the recent past to reveal the heritage shared by East and West, she expresses the hope that the cycle can be broken.